For the war in Italy, see Gothic War (535–554). 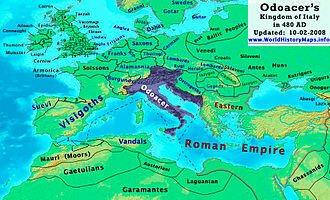 Between about 376 and 382 the Gothic War against the Eastern Roman Empire, and in particular the Battle of Adrianople, is commonly seen as a major turning point in the history of the Roman Empire, the first of a series of events over the next century that would see the collapse of the Western Roman Empire, although its ultimate importance to the Empire's eventual fall is still debated. In the summer of 376, a massive number of Goths arrived on the Danube River, the border of the Roman Empire, requesting asylum from the Huns. There were two groups: the Thervings led by Fritigern and Alavivus and the Greuthungi led by Alatheus and Saphrax. Eunapius states their number as 200,000 including civilians but Peter Heather estimates that the Thervings may have had only 10,000 warriors and 50,000 people in total, with the Greuthungi about the same size. The Cambridge Ancient History places modern estimates at around 90,000 people. The Goths sent ambassadors to Valens, the Eastern Roman Emperor, requesting permission to settle their people inside the Empire. It took them some time to arrive, for the Emperor was in Antioch preparing for a campaign against the Sasanian Empire over control of Armenia and Iberia. 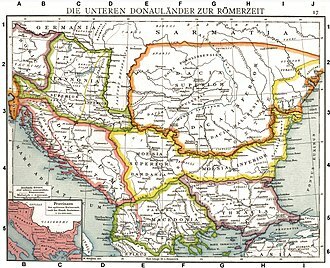 The bulk of his forces were stationed in the East, far away from the Danube. Ancient sources are unanimous that Valens was pleased at the appearance of the Goths, as it offered the opportunity of new soldiers at low cost. With Valens committed to action on the Eastern frontier, the appearance of a large number of barbarians meant his skeleton force in the Balkans were outnumbered. Valens must have appreciated the danger when he gave the Thervings permission to enter the empire and the terms he gave them were highly favorable. This was not the first time barbarian tribes had been settled; the usual course was that some would be recruited into the army and the rest would be broken up into small groups and resettled across the empire at the Emperor's discretion. This would keep them from posing a unified threat and assimilate them into the greater Roman population. The agreement differed with the Thervings by allowing them to choose the place of their settlement, Thrace, and allowed them to remain united. During the negotiations, the Thervings also expressed a willingness to convert to Christianity. As for the Greuthungi, Roman army and naval forces blocked the river and denied them entry. The Thervings were probably allowed to cross at or near the fortress of Durostorum. They were ferried by the Romans in boats, rafts and in hollowed tree-trunks; "diligent care was taken that no future destroyer of the Roman state should be left behind, even if he were smitten by a fatal disease," according to Ammianus Marcellinus. Even so, the river swelled with rain and many drowned. The Goths were to have their weapons confiscated but, either because the Romans in charge accepted bribes; the Romans did not have the manpower to check all of the incoming warriors; or because warriors recruited into the Roman army would need their own arms, many Goths were allowed to retain their weapons. [a] The Romans placed the Thervings along southern bank of the Danube in Lower Mœsia as they waited for the land allocations to begin. In the interim, the Roman state was to provide them food. So many people in so small an area caused a food shortage and eventually the Thervings began to starve. Roman logistics could not cope with the vast numbers, and officials under the command of Lupicinus simply sold off much of the food before it reached the hands of the Goths. Desperate, Gothic families sold many of their children into slavery to Romans for dog meat at the price of one child per one dog. This treatment caused the Therving Goths to grow rebellious and Lupicinus decided to move them south to Marcianople, his regional headquarters. To guard the march south, Lupicinus was forced to pull out the Roman troops guarding the Danube, which allowed the Greuthungi promptly to cross into Roman territory. The Thervings then deliberately slowed their march to allow the Greuthungi to catch up. As the Thervings neared Marcianople, Lupicinus invited Fritigern, Alavivus and a small group of their attendants to dine with him inside the city. The bulk of the Goths were encamped some distance outside, with Roman troops between them and the city. Due to the persistent refusal of the Roman soldiers to allow the Goths to buy supplies in the town's market, fighting broke out and several Roman soldiers were killed and robbed. Lupicinus, having received the news as he sat at the banquet with the Gothic leaders, ordered Fritigern and Alavivus held hostage and their retainers executed. When news of the killings came to the Goths outside, they prepared to assault Marcianople. Fritigern advised Lupicinus that the best way to calm the situation was to allow him to rejoin his people and show them that he was still alive. Lupicinus agreed and set him free. Alavivus is not mentioned again in the sources and his fate is unknown. Having survived the chaos of the night and the earlier humiliations, Fritigern and the Thervings decided it was time to break the treaty and rebel against the Romans and the Greuthungi immediately joined them. 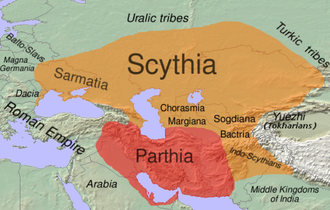 Fritigern led the Goths away from Marcianople towards Scythia. Lupicinus and his army pursued them 14 km (8.7 mi) from the city, fought the Battle of Marcianople and were annihilated. All the junior officers were killed, the military standards were lost and the Goths secured new weapons and armor from the dead Roman soldiers. Lupicinus survived and escaped back to Marcianople. The Thervings then raided and pillaged throughout the region. At Adrianople a small Gothic force employed by the Romans was garrisoned under the command of Sueridus and Colias, who were themselves Goths. 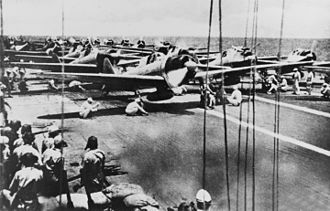 When they received news of the events they decided to remain in place "considering their own welfare the most important thing of all." The Emperor, afraid of having a Roman garrison under Gothic control so close to a Gothic rebellion, ordered Sueridus and Colias to march east to Hellespontus. The two commanders asked for food and money for the journey, as well as a postponement of two days to prepare. The local Roman magistrate, angry at this garrison for having earlier pillaged his suburban villa, armed people from the city and stirred them against the garrison. The mob demanded that the Goths follow orders and leave immediately. The men under Sueridus and Colias initially stood still but when they were pelted with curses and missiles from the mob, attacked and killed many. The garrison left the city and joined Fritigern and the Goths besieged Adrianople. But lacking the equipment and the experience to conduct a siege and losing many men to missiles, they abandoned the city. Fritigern declared he now "kept peace with walls". The Goths once again dispersed to loot the rich and undefended countryside. Using prisoners and Roman traitors, the Goths were led to hidden hoards, rich villages and such places. Many Goths inside Roman territory joined Fritigern, as did assorted slaves, miners and prisoners. Roman garrisons in fortified towns held out but those outside of them were easy prey. The Goths created a vast wagon train to hold all the loot and supplies pillaged from the Roman countryside and they had much rage against the Roman population for what they had endured. Those who had started as starving refugees had transformed into a powerful army. Valens, now recognizing the seriousness of the situation from his base in Antioch, sent general Victor to negotiate an immediate peace with the Sassanids. He also began to transfer the Eastern Roman army to Thrace. While the main army mobilized, he sent ahead an advance force under Traian and Profuturus. Valens also reached out to the Western Roman Emperor Gratian, his co-emperor and nephew, for aid. Gratian responded by sending the comes domesticorum Richomeres and the comes rei militaris Frigeridus, to guard the western passes through the Haemus mountains, to contain the Goths from spreading westward and for eventual linkup with the Eastern army. These huge movements of troops and the cooperation of the West, spoke to the grave threat the Goths posed. Traian and Profuturus arrived leading troops of Armenians but Frigeridus, leading the Pannonian and the transalpine auxiliaries, fell ill from gout. Richomeres, having led a force cut from Gratian's palatine army, by the mutual consent of the other leaders took command of the combined forces, probably at Marcianople. The Goths withdrew north of the Haemus mountains and the Romans moved to engage. At a place called Ad Salices[b] ("The Willows"), they fought the Battle of the Willows. The Romans were outnumbered and during the battle their left wing began to collapse. Only with hasty reinforcements and Roman discipline was the situation retrieved. The battle lasted until dusk when the opposing armies broke off, the Goths withdrawing into their wall of wagons, leaving the battle a bloody draw. Both sides counted heavy losses, including Profuturus who was slain on the battlefield. After the battle the Romans retreated to Marcianople and the Goths of Fritigern spent seven days within their wagon fort before moving out. Frigeridus destroyed and enslaved a band of marauding Goths under Farnobius and sent the survivors to Italy. In the fall, Richomeres returned to Gaul to collect more troops for the next year's campaign. Valens meanwhile sent magister equitum Saturninus to Thrace to linkup with Traian. 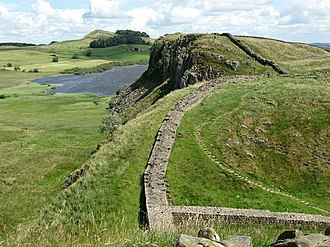 Saturninus and Traian erected a line of forts in the Haemus passes to block the Goths. The Romans hoped to weaken the enemy with the rigors of winter and starvation and then lure Fritigern into open battle on the plains between the Haemus mountains and the Danube to finish him off. The Goths, once again hungry and desperate, tried to break through the passes but were repulsed each time. Fritigern then enlisted the aid of mercenary Huns and Alans, who boosted his strength. Saturninus, realizing he could no longer hold the passes against them, abandoned the blockade and retreated. The Goths were thus free to raid anew, reaching as far as the Rhodope Mountains and the Hellespont. The Goths, joined by their new allies the Huns and Alans, travelled south in search of plunder and close to the city of Deultum won the Battle of Deultum destroying most of the Eastern Roman army and the city. Barzimeres, tribunum scutariorum (Commander of the Guards), was killed and Equitius, cura palatii (Marshal of the Court), was captured. The Goths marched on Augusta Trajana to attack the general Frigiderus but his scouts detected the invaders and he promptly withdrew to Illyria but the city was also destroyed. Equitius later managed to escape from captivity. Archaeological finds in this region and dated to this period reveal Roman villas with signs of abandonment and deliberate destruction. The devastation forced Valens to officially reduce taxes on the populations of Mœsia and Scythia. Valens finally extracted himself from the Eastern front, after granting many concessions to the Persians and arrived with most of his army in Constantinople on 30 May 378. His entry into the city caused small riots against him. According to the Historia Ecclesiastica of Socrates Scholasticus, the citizens of the capital accused Emperor Valens of neglecting their defense, exposing them to the raids of the Goths who now threatened Constantinople itself and urged him to leave the city and confront the invaders with battle instead of continuing to delay. Valens left the city after twelve days and moved with his army to his imperial villa Melanthias, west of Constantinople, on 12 June. There he distributed pay, supplies and speeches to his soldiers to boost morale. 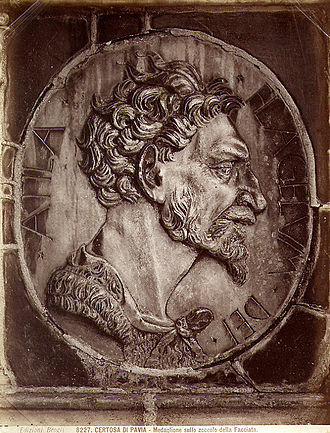 Blaming Traian for the bloody draw at The Willows, Valens demoted him and appointed Sebastianus, who had arrived from Italy, to command and organize the Eastern Roman army. Sebastianus set out with a small force, drawn from the Emperor's own Scholae Palatinae,[c] to engage separated Gothic raiding bands. He went first to Adrianople and such was the fear of the roving Goths, the city needed much persuasion to open its gates to him. After this, Sebastianus scored a few small victories. In one instance, he waited until nightfall to ambush a sleeping Gothic warband along the river Hebrus and slaughtered most of them. The loot Sebastianus brought back was, according to Ammianus, too much for Adrianople to hold. Sebastianus' success convinced Fritigern to recall his raiding parties to the area of Cabyle, lest they be picked off piecemeal. Western Roman Emperor Gratian had meant to join up with Valens' army but events in the West detained him. First there was an invasion by the Lentienses into Gaul in February 379, which Gratian defeated. Then intelligence came from the other side of the Rhine warning of barbarian preparations for more invasions. This forced Gratian to preemptively cross the river himself and bring the situation under control and he successfully defeated the Alemanni. This took time, however and it wasn't until August that Gratian sent a message declaring his victories and his imminent arrival. Valens, who had been impatiently waiting since June for the Western Roman army, was envious of the glory of his nephew and that of Sebastianus, so when he heard that the Goths were moving south towards Adrianople, Valens decamped his army and marched there to head them off. Roman scouting erroneously reported that the Goths, who were seen raiding near Nika, numbered only 10,000 fighting men. Around 7 August Richomeres returned from the West with the Western armies' advanced guard and a new message: Gratian was nearing the Succi pass which led to Adrianople and he advised his uncle to wait for him. Valens called a council of war to decide the issue. According to Ammianus, Sebastianus advocated for an immediate assault upon the Goths and that Victor cautioned to wait for Gratian. 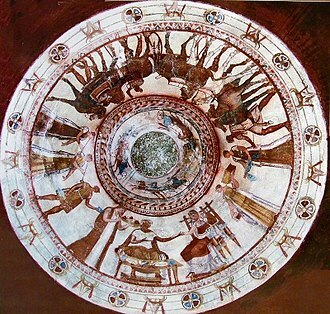 According to Eunapius, Sebestianus said they should wait. In any case, the council and Valens decided to attack immediately, egged on by court flatterers of the easy victory to come. The Battle of Adrianople saw one of the worst defeats ever suffered by the Roman army. Map of the battle, according to the History Department of the US Military Academy. The Goths sent envoys led by a Christian priest to the Romans to negotiate on the night of 8 August. With them Fritigern sent two letters. The first stipulated that the Goths only wanted lands in Thrace and in exchange would ally themselves to the Romans. The second letter, privately addressed to Valens, said that Fritigern truly wanted peace but the Romans would have to stay mobilized so that he could enforce the peace on his own people. Whether Fritigern was earnest or not is unknown, as Valens rejected the proposal. On the morning of 9 August, Valens left his treasury, imperial seal and civilian officials in Adrianople and marched north to engage the Goths. At around two in the afternoon the Romans came within sight of the Gothic wagon fort. Unlike the Romans, the Goths were well rested and the two sides drew up into battle formations. Fritigern sent more peace envoys and had long since sent for the aid of the Greuthungi cavalry under Alatheus and Saphrax who were separated from the main Gothic body. These remained undetected by Roman scouts. The Eastern Roman army withered under the hot summer sun and the Goths lit fires to blow smoke and ash into the Roman formations. Valens reconsidered the peace offer and was preparing to send Richomeres to meet with Fritigern when two Roman elite Scholae Palatinae units, the Scutarii under Cassio and the Sagittarii under Bacurius, engaged the Goths without orders. This forced the Battle of Adrianople to begin. As the armies engaged, the Greuthungi and Alan cavalry arrived and swung the battle in favor of the Goths. 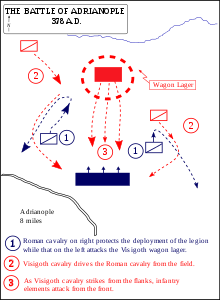 The Roman left flank was surrounded and destroyed and a rout began all along the lines which became a bloodbath for the Roman forces. They were so tightly packed they could not maneuver and some could not lift their arms at all. Few managed to run. Sebastianus, Traian, tribune Aequitius and thirty-five senior officers had been slain, while Richomeres, Victor and Saturninus had escaped. Two-thirds of the Eastern Roman army lay dead upon the field. There are conflicting stories as to what happened to the Emperor himself. One claims that he was wounded and dragged off the field by some of his men to a farmhouse. The Goths approached it and were shot at with arrows, which caused the Goths to burn it down with the Emperor inside. The other report states Valens was slain in combat on the field with his army. Whatever happened, his body was never found. The Goths, invigorated by their incredible victory, besieged Adrianople but the city resisted. Its walls were strengthened, huge stones were placed behind the gates and arrows, stones, javelins and artillery rained down upon the attackers. The Goths lost men but made no progress. So they resorted to trickery: they ordered some Roman traitors to pretend to be fleeing from the Goths and infiltrate the city, where they were to set fires to allow the Goths, while the citizens were busy putting the fires out, to attack the undefended walls. The plan did not work. 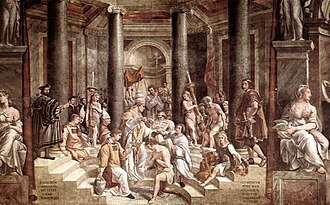 The Roman traitors were welcomed into the city but when their stories did not match, they were imprisoned and tortured. They confessed to the trap and were beheaded. The Goths launched another assault but it too failed. With this final defeat, the Goths gave up and marched away. They together with some Huns and Alans went first to Perinthus and then to Constantinople. 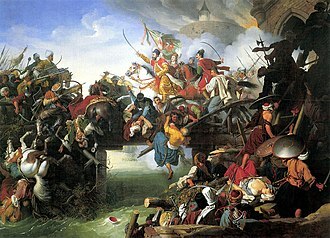 There they were fended off in the small battle of Constantinople with the help of the city's Arab garrison. At one moment, an Arab dressed only in a loincloth rushed forward against the Goths, slit one of their throats and sucked out the blood. This terrified the Goths and combined with the immense size of the city and its walls, they decided to march off once again to plunder the countryside. The new Emperor of the Eastern Roman Empire, Theodosius I. For the events of the Gothic War between 379 and 382, there are few sources and accounts become more confused, especially concerning the rise of Theodosius I as the new Eastern Roman Emperor. Theodosius, who had been born in Hispania, was the son of a successful general. Theodosius himself had been dux Mœsiae and campaigned in the eastern Balkans against the Sarmatians in 374. But in 376, his father fell victim to court intrigue following the death of Western Roman Emperor Valentinian I and Theodosius decided to retire to his estates in Spain. Why then he was recalled to the East is a mystery, though undoubtedly his military experience and the critical need for it in any new emperor played a part. It seems Theodosius regained his post as dux Mœsiae and was probably campaigning against the Goths by late 378. On 19 January 379, Theodosius was made emperor. Sources are silent on how this happened. Whether Gratian initiated Theodosius' elevation himself, or the surviving army in the East forced Gratian to accept Theodosius as his colleague, is unknown. Whatever the cause, Gratian did acknowledge Theodosius as his co-emperor but promptly left for the West to deal with the Alemanni. Gratian offered little help to Theodosius for dealing with the Goths, outside of giving him control of the Western imperial dioceses of Dacia and Macedonia. Theodosius set about recruiting a new army at his headquarters in Thessalonica. Farmers were drafted and barbarian mercenaries from beyond the Danube were bought. The drafting of farmers created much resentment. Some mutilated their own thumbs but many more hid themselves or deserted with the help of landowners, who were not pleased with losing their workers to the army. Theodosius responded with many harsh laws punishing those who hid deserters and rewarding those who turned them in. Even those who mutilated themselves were still forced into the Roman military. Theodosius' general Modares, a Goth himself, won a minor victory against Fritigern. Even small victories such as these were massively lauded by imperial propagandists; there are records of victory celebrations equaling half that of the previous seven decades combined. Theodosius needed victories and needed to be seen as dealing with the Gothic crisis. In 380, the Goths split. 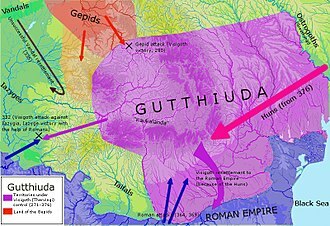 [e] The Greuthungi went to Illyricum and invaded the Western province of Pannonia. What happened is again disputed; they were either defeated by Gratian's forces, or they peaceably signed a deal that settled them in Pannonia. The Thervings went south into Macedonia and Thessaly. Theodosius with his new army marched to meet them but, filled with unreliable barbarians and raw recruits, it melted away. The barbarian soldiers joined Fritigern and many Romans deserted. With victory the Thervings were free to force the local Roman cities in this new region to pay them tribute. It was then that the Western Roman Empire finally offered some help. Having ended the Gothic invasion of Pannonia, Gratian met Theodosius at Sirmium and Gratian directed his generals Arbogast and Bauto to help drive the Goths back into Thrace, which they successfully accomplished by the summer of 381. Theodosius meanwhile left for Constantinople, where he stayed. After years of war, the defeat of two Roman armies and still locked in stalemate, peace negotiations were opened. Richomeres and Saturninus conducted the negotiations for the Romans and peace was declared on 3 October 382. By then, the Gothic commanders from Adrianople were gone; Fritigern, Alatheus and Saphrax are never again mentioned in the ancient histories and their ultimate fates are unknown. Speculation ranges from death in battle to overthrown as the price for peace. In the peace, the Romans recognized no overall leader of the Goths and the Goths were nominally incorporated into the Roman Empire. The Romans gained a military alliance with them as foederati: the Goths would be drafted into the Roman army and in special circumstances could be called upon to field full armies for the Romans. What differed from established Roman practice was that the Goths were given lands inside the Roman Empire itself, in the provinces of Scythia, Mœsia and possibly Macedonia, under their own authority and were not dispersed. This allowed them to stay together as a unified people with their own internal laws and cultural traditions. To seal the agreement, Theodosius threw the Goths a large feast. Themistius, a Roman orator and imperial propagandist, while acknowledging that the Goths could not be militarily defeated, sold the peace as a victory for the Romans who had won the Goths over to their side and turned them into farmers and allies. He believed that in time the barbarian Goths would become steadfast Romans themselves like the barbarian Galatians had before them. Despite these hopes, the Gothic War changed the way the Roman Empire dealt with barbarian peoples, both without and within. The Therving Goths would now be able to negotiate their position with Rome, with force if necessary, as a unified people inside the borders of the Empire and would transform themselves into the Visigoths. At times they would act as friends and allies to the Romans, at other times as enemies. This change in Rome's relationship with barbarians would lead to the sack of Rome in 410. The Gothic War also affected the religion of the Empire. Valens had been an Arian Christian and his death at Adrianople helped pave the way for Theodosius to make Nicene Christianity the dominant form of Christianity for the Roman people. The Goths, like many barbarian peoples, converted to Arianism. ^ Peter Heather finds it unconvincing that Valens, who wanted the Goths as auxiliaries in his army, would have them disarmed. ^ The exact location is unknown but it is surmised that it was between Tomi and the mouth of the Danube, or perhaps nearer to Marcianopole. ^ "three hundred soldiers from each legion"
^ What happened is disputed. Our two primary sources for the event, Ammianus and Zosimus, give differing accounts and dates. The account given here is Kulikowski's reading of the sequence of events. ^ The exact cause is disputed. Peter Heather speculates the split happened because the combined Gothic forces were simply too hard to feed. ^ Mitchell, 2007, p. 87. ^ Lee, 2013, p. 28. ^ Prusac, 2016, p. 74. ^ Heather, 2005, p. 146. ^ Wolfram, 1997, pp. 85–86. ^ Heather, 2005, p. 145. ^ Heather, 2005, p. 152. ^ Heather, 2005, pp. 145, 507. ^ CAH, 1998, p. 98. ^ Heather, 2005, pp. 152–153. ^ Heather, 2005, pp. 153, 161. ^ Heather, 2005, p. 158. ^ Heather, 2005, p. 161. ^ Heather, 2005, pp. 160–162. ^ Ammianus Marcellinus, XXXI 4. ^ Kulikowski, 2006, p. 130. ^ Heather, 2005, p. 509. ^ Heather, 2005, p. 163. ^ Wolfram, 1997, p. 82. ^ Kulikowski, 2006, p. 131. ^ Heather, 2005, p. 159. ^ Heather, 2005, p. 164. ^ Kulikowski, 2006, p. 133. ^ Kulikowski, 2006, pp. 133–134. ^ Heather, 2005, p. 171. ^ Ammianus Marcellinus, XXXI.6.7–8. Trans. J. C. Rolfe. ^ Kulikowski, 2006, pp. 134. ^ Kulikowski, 2006, p. 136. ^ Heather, 2005, pp. 172–173. ^ Kulikowski, 2006, p. 137. ^ Burns, 1994, pp. 26–27. ^ Burns, 1994, p. 27. ^ Kulikowski, 2006, pp. 137–138. ^ Heather, 2005, p. 173. ^ Ammianus Marcellinus, XXXI.8.7–8. Trans. J. C. Rolfe. ^ Heather, 2005, p. 175. ^ Kulikowski, 2006, p. 138. ^ Heather, 2005, pp. 176–177. ^ Kulikowski, 2006, p. 139. ^ Socrates Scolasticus, Historia Ecclesiastica, IV.38. ^ Heather, 2005, p. 177. ^ Ammianus Marcellinus, XXXI.11.2. Trans. J. C. Rolfe. ^ Kulikowski, 2006, pp. 140–142. ^ Heather, 2005, pp. 178–180. ^ Kulikowski, 2006, p. 123. ^ Kulikowski, 2006, pp. 139–141. ^ Heather, 2005, pp. 177–180. ^ CAH, 1998, p. 100. ^ Ammianus Marcellinus, XXXI.13.10–11. Trans. J. C. Rolfe. ^ Kulikowski, 2006, p. 143. ^ Heather, 2005, p. 180. ^ Kulikowski, 2006, p. 146. ^ Kulikowski, 2006, pp. 146–147. ^ Kulikowski, 2006, pp. 149–150. ^ Lee, 2007, p. 29. ^ CAH, 1998, pp. 101–102. ^ Williams, Friell, 1998, pp. 15–16. ^ Kulikowski, 2006, pp. 150–151. ^ Heather, 2005, p. 183. ^ Heather, 2005, pp. 183–185. ^ Heather, Moncur, 2001, p. 224. ^ Heather, Moncur, 2001, p. 207. ^ Heather, 2005, pp. 185–186. ^ Kulikowski, 2006, pp. 152–153. ^ Heather, 2005, pp. 163, 186, 511. ^ Heather, Moncur, 2001, p. 280. ^ Panella, 2000, p. 225. ^ Kulikowski, 2006, p. 145. ^ Heather, 2005, pp. 186, 502. ^ Wolfram, 1997, p. 87. Ammianus Marcellinus , The History, XXXI. Burns, Thomas S. (1994). Barbarians Within the Gates of Rome: A Study of Roman Military Policy and the Barbarians, Ca. 375–425 A.D. Bloomington and Indianapolis: Indiana University Press. ISBN 978-0-253-31288-4. Cameron, A.; Garnsey, P. (1998). The Cambridge Ancient History. 13. London: Cambridge University Press. ISBN 978-1-139-05440-9. Gibbon, Edward (1776). The History Of The Decline & Fall Of The Roman Empire. New York: Penguin. ISBN 978-0-14-043393-7. Heather, P.; Moncur, D. (2001). Politics, Philosophy and Empire in the Fourth Century: Select Orations of Themistius. Translated Texts for Historians. 36. Liverpool: Liverpool University Press. ISBN 978-1-84631-382-0. Heather, P. (2005). The Fall of the Roman Empire. ISBN 978-0-19-515954-7. Kulikowski, M. (2007). Rome's Gothic Wars. ISBN 978-0-521-8-4633-2. Lee, A. D. (2007). War in Late Antiquity: A Social History. Ancient World at War. Oxford: Blackwell. ISBN 978-0-631-22925-4. Lee, A. D. (2013). From Rome to Byzantium AD 363 to 565: The Transformation of Ancient Rome. Edinburgh: Edinburgh University Press. ISBN 978-0-7486-2791-2. Mitchell, Stephen (2007). A History of the Later Roman Empire, AD 284-641: The Transformation of the Ancient World. Oxford: Blackwell Publishing. ISBN 978-1-4051-0856-0. Panella, R. J. (2000). The Private Orations of Themistius. Berkeley: University of California Press. Prusac, Marina (2016). From Face to Face: Recarving of Roman Portraits and the Late-antique Portrait Arts. Leiden and Boston: Brill. ISBN 978-90-04-32184-7. Williams, S.; Friell, J. G. P. (1998) . Theodosius: The Empire at Bay. Roman Imperial Biographies. New York: Yale University Press. ISBN 978-0-300-07447-5. The Battle of Adrianople, sometimes known as the Battle of Hadrianopolis, was fought between an Eastern Roman army led by the Eastern Roman Emperor Valens and Gothic rebels led by Fritigern. The battle took place about 13 km north of Adrianople in the Roman province of Thracia and it ended with an overwhelming victory for the Goths and the death of Emperor Valens. Part of the Gothic War, the battle is considered the start of the process which led to the fall of the Western Roman Empire in the 5th century. It was fought by the forces of the Eastern Roman Empire and we have a detailed account for the lead up to the battle from the Roman perspective from Ammianus Marcellinus, which forms the culminating point at the end of his history. The position in his histories and the lack of a history for the following century has tended to exaggerate the significance of the battle for historians. Ammianuss account of the battle itself, as to be expected from a side, is far from clear. Heat and dust seem to have particularly significant. Much of what follows about the battle itself is modern supposition, in 376 AD, displaced by the invasions of the Huns, the Goths, led by Alavivus and Fritigern, asked to be allowed to settle in the Eastern Roman Empire. Hoping that they would become farmers and soldiers, the Eastern Roman emperor Valens allowed them to themselves in the Empire as allies. However, once across the Danube, the dishonesty of the provincial commanders Lupicinus and Maximus led the newcomers to revolt after suffering many hardships, Valens asked Gratian, the western emperor, for reinforcements to fight the Goths. Gratian sent the general Frigeridus with reinforcements, as well as the leader of his guards, for the next two years preceding the battle of Adrianople there were a series of running battles with no clear victories for either side. In 378, Valens decided to control himself. Valens would bring troops from Syria and Gratian would bring more troops from Gaul. Valens left Antioch for Constantinople, and arrived on the 30th of May and he appointed Sebastianus, newly arrived from Italy, to reorganize the Roman armies already in Thrace. For other figures with this name, including his paternal grandfather, see Gratian. Gratian was Roman emperor from 367 to 383, the eldest son of Valentinian I, during his youth Gratian accompanied his father on several campaigns along the Rhine and Danube frontiers. Upon the death of Valentinian in 375, Gratians brother Valentinian II was declared emperor by his fathers soldiers, in 378, Gratians generals won a decisive victory over the Lentienses, a branch of the Alamanni, at the Battle of Argentovaria. Gratian subsequently led a campaign across the Rhine, the last emperor to do so and that same year, his uncle Valens was killed in the Battle of Adrianople against the Goths – making Gratian essentially ruler of the entire Roman Empire. He favoured Christianity over traditional Roman religion, refusing the divine attributes of the Emperors, Gratian was the son of Emperor Valentinian I by Marina Severa, and was born at Sirmium in Pannonia. He was named after his grandfather Gratian the Elder, Gratian was first married to Flavia Maxima Constantia, daughter of Constantius II. His stepmother was Empress Justina and his half siblings were Emperor Valentinian II, Galla. On 24 August 367 he received from his father the title of Augustus, on the death of Valentinian, the troops in Pannonia proclaimed his infant son emperor under the title of Valentinian II. The division, was nominal, and the real authority remained in the hands of Gratian. Gratians general Mallobaudes, a king of the Franks, and Naniemus, completely defeated the Lentienses, upon receiving news of the victory, Gratian personally led a campaign across the Upper Rhine into the territory of the Lentienses. After initial trouble facing the Lentienses on high ground, Gratian blockaded the enemy instead, the Lentienses were forced to supply young men to be levied into the Roman army, while the remainder were allowed to return home. Later that year, Valens met his death in the Battle of Adrianople on 9 August. 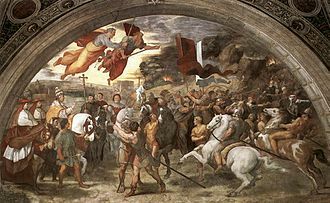 Valens refused to wait for Gratian and his army to arrive and assist in defeating the host of Goths and Huns, as a result and Theodosius cleared the Illyricum of barbarians in the Gothic War. The Thervingi, Tervingi, or Teruingi were a Gothic people of the Danubian plains west of the Dniester River in the 3rd and the 4th centuries. They had close contacts with the Greuthungi, another Gothic people from east of the Dniester, the name Thervingi may mean forest people. History lacks evidence for the name pair Thervingi-Greuthungi earlier than the late 3rd century, the name Thervingi may have pre-Pontic, origins. The Thervingi first appeared in history as a people in the year 268 when they invaded the Roman Empire. This invasion overran the Roman provinces of Pannonia and Illyricum and even threatened Italia itself, the Thervingi were defeated in battle that summer near the modern Italian-Slovenian border and routed in the Battle of Naissus that September. Over the next three years they were back over the Danube River in a series of campaigns by the emperors Claudius II Gothicus. The division of the Goths is first attested in 291, the Thervingi are first attested around that same date. The term Vandals may have been erroneous for Victohali because around 360 the historian Eutropius reports that Dacia was currently inhabited by Taifali, Victohali, in 367, the Roman Emperor Valens attacked the Thervingi north of the Danube river. However, he was unable to hit them directly, because apparently the bulk of the Goths retreated to the Montes Serrorum, ammianus Marcellinus says that Valens could not find anyone to fight with and even implies that all of them fled, horror-struck, to the mountains. In the following year, the flooding of the Danube prevented the Romans from crossing the river, in 369, Valens penetrated deep into the Gothic territory, winning a series of skirmishes with Greuthungi. Here, they hoped to find refuge from the Huns, the Battle of Adrianople in 378 was the decisive moment of the war. In time and geographical area, the Thervingi and their neighbors the Greuthungi correspond to the archaeological Sîntana de Mureş-Chernyakhov Culture, Chernyakhov settlements cluster in open ground in river valleys. 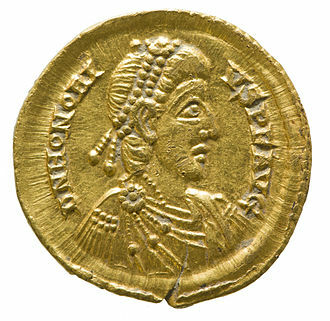 Valentinian II, was Roman Emperor from AD375 to 392. Flavius Valentinianus was born to Emperor Valentinian I and his second wife and he was the half-brother of Valentinian’s other son, who had shared the imperial title with his father since 367. He had three sisters Galla and Justa, the elder Valentinian died on campaign in Pannonia in 375. Neither Gratian nor his uncle Valens were consulted by the commanders on the scene. Instead of merely acknowledging Gratian as his father’s successor, Valentinian I’s generals acclaimed the four-year-old Valentinian augustus on 22 November 375. The army, and its Frankish general Merobaudes, may have been uneasy about Gratians lack of military ability, and so raised a boy who would not immediately aspire to military command. Gratian, forced to accommodate the generals who supported his half-brother, governed the provinces, while Italy, part of Illyricum. In 378, their uncle, the Emperor Valens, was killed in battle with the Goths at Adrianople, and Gratian invited the general Theodosius to be emperor in the East. As a child, Valentinian II was under the influence of his Arian mother, the Empress Justina, and the court at Milan. Justina used her influence over her son to oppose the Nicean party which was championed by Ambrose. In 385 Ambrose, backed by Milans populace, refused an imperial request to hand over the Portian basilica for the use of Arian troops. In 386 Justina and Valentinian received the Arian bishop Auxentius and his congregation barricaded themselves inside the church, and the imperial order was rescinded. Magnus Maximus used the emperor’s heterodoxy against him, and even his eventual protector, Valentinian tried to restrain the despoiling of pagan temples in Rome. Valentinian, at the insistence of Ambrose, refused the request and, in so doing, rejected the traditions, in 383, Magnus Maximus, commander of the armies in Britain, declared himself Emperor and established himself in Gaul and Hispania. For a time the court of Valentinian, through the mediation of Ambrose, came to an accommodation with the usurper, in 386 or 387, Maximus crossed the Alps into the Po valley and threatened Milan. Moesia was an ancient region and Roman province situated in the Balkans, along the south bank of the Danube River. 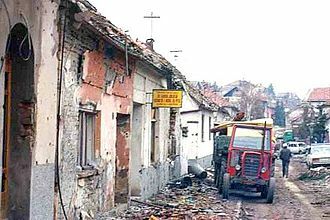 It included most of the territory of modern-day Serbia and the parts of the modern Republic of Macedonia, as well Northern Bulgaria. In ancient geographical sources, Moesia was bounded to the south by the Haemus and Scardus mountains, to the west by the Drinus river, on the north by the Donaris, the region was inhabited chiefly by Thracians, Dacians and Thraco-Illyrian peoples. The name of the region comes from Moesi, Thraco-Dacian peoples who lived there before the Roman conquest, parts of Moesia belonged to the polity of Burebista, a Getae king who established his rule over a large part of the Northern Balkans between 82 BC and 44 BC. He led plunder and conquest raids across Central and Southeastern Europe, after his assassination in an inside plot, the empire was divided into several smaller states. 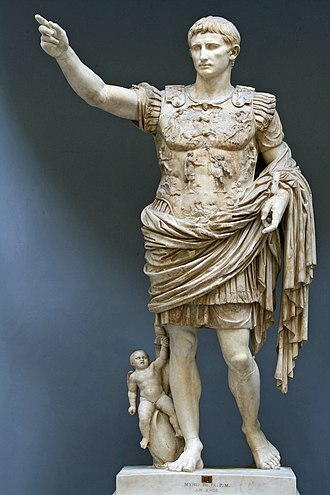 The region, was not organized as a province until the last years of Augustus reign, in 6 AD, mention is made of its governor, as a province, Moesia was under an imperial consular legate. In 86 AD the Dacian king Duras ordered his troops to attack Roman Moesia, each was governed by an imperial consular legate and a procurator. From Moesia, Domitian began planning future campaigns into Dacia and by 87 he started an offensive against Dacia. Therefore, in the summer of 87, Fuscus led five or six legions across the Danube. The campaign against the Dacians ended without an outcome, and Decebalus. Emperor Trajan arrived in Moesia, and he launched his first military campaign into the Dacian Kingdom c, march–May 101, crossing to the northern bank of the Danube River and defeating the Dacian army near Tapae, a mountain pass in the Carpathians. Trajans troops were mauled in the encounter, and he put off further campaigning for the year to heal troops, during the following winter, King Decebalus launched a counter-attack across the Danube further downstream, but this was repulsed. Trajans army advanced further into Dacian territory and forced King Decebalus to submit to him a year later, Trajan returned to Rome in triumph and was granted the title Dacicus. The Goths were an East Germanic people, two of whose branches, the Visigoths and the Ostrogoths, played an important role in the fall of the Western Roman Empire and the emergence of Medieval Europe. In the Gothic language they were called the Gut-þiuda, most commonly translated as Gothic people, gut-þiudai, or Gutans Inferred from gen. pl. gutani in Pietroassa inscription. In Old Norse they were known as the Gutar or Gotar, in Latin as the Gothi, the exact origin of the ancient Goths is unknown. Evidence of them before they interacted with the Romans is limited, Modern academics have generally abandoned this theory. Today, the Wielbark culture is thought to have developed from earlier cultures in the same area, archaeological finds show close contacts between southern Sweden and the Baltic coastal area on the continent, and further towards the south-east, evidenced by pottery, house types and graves. Rather than a migration, similarities in the material cultures may be products of long-term regular contacts. However, the record could indicate that while his work is thought to be unreliable. Sometime around the 1st century AD, Germanic peoples may have migrated from Scandinavia to Gothiscandza, early archaeological evidence in the traditional Swedish province of Östergötland suggests a general depopulation during this period. However, there is no evidence for a substantial emigration from Scandinavia. Upon their arrival on the Pontic Steppe, the Germanic tribes adopted the ways of the Eurasian nomads, the first Greek references to the Goths call them Scythians, since this area along the Black Sea historically had been occupied by an unrelated people of that name. The earliest known material culture associated with the Goths on the southern coast of the Baltic Sea is the Wielbark culture, centered on the modern region of Pomerania in northern Poland. This culture replaced the local Oxhöft or Oksywie culture in the 1st century, the culture of this area was influenced by southern Scandinavian culture beginning as early as the late Nordic Bronze Age and early Pre-Roman Iron Age. 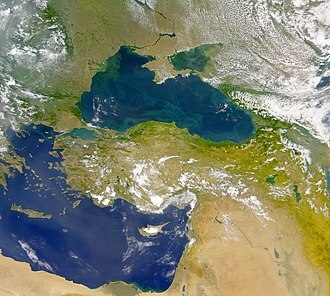 The Balkan Peninsula, or the Balkans, is a peninsula and a cultural area in Eastern and Southeastern Europe with various and disputed borders. 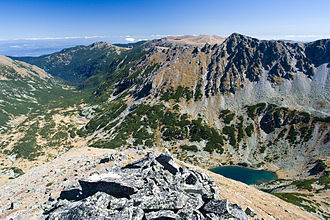 The region takes its name from the Balkan Mountains that stretch from the Serbia-Bulgaria border to the Black Sea, the highest point of the Balkans is Mount Musala 2,925 metres in the Rila mountain range. In Turkish, Balkan means a chain of wooded mountains, the name is still preserved in Central Asia with the Balkan Daglary and the Balkan Province of Turkmenistan. 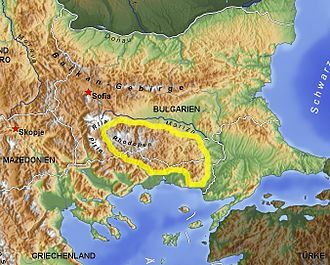 A less popular hypothesis regarding its etymology is that it derived from the Persian Balā-Khāna, from Antiquity through the Middle Ages, the Balkan Mountains had been called by the local Thracian name Haemus. According to Greek mythology, the Thracian king Haemus was turned into a mountain by Zeus as a punishment, a reverse name scheme has been suggested. D. Dechev considers that Haemus is derived from a Thracian word *saimon, a third possibility is that Haemus derives from the Greek word haema meaning blood. The myth relates to a fight between Zeus and the monster/titan Typhon, Zeus injured Typhon with a thunder bolt and Typhons blood fell on the mountains, from which they got their name. The earliest mention of the name appears in an early 14th-century Arab map, the Ottomans first mention it in a document dated from 1565. There has been no other documented usage of the word to refer to the region before that, there is a claim about an earlier Bulgar Turkic origin of the word popular in Bulgaria, however it is only an unscholarly assertion. The word was used by the Ottomans in Rumelia in its meaning of mountain, as in Kod̲j̲a-Balkan, Čatal-Balkan, and Ungurus-Balkani̊. The concept of the Balkans was created by the German geographer August Zeune in 1808, during the 1820s, Balkan became the preferred although not yet exclusive term alongside Haemus among British travelers. Among Russian travelers not so burdened by classical toponymy, Balkan was the preferred term, zeunes goal was to have a geographical parallel term to the Italic and Iberian Peninsula, and seemingly nothing more. The Obelisk of Theodosius is the Ancient Egyptian obelisk of Pharaoh Thutmose III re-erected in the Hippodrome of Constantinople by the Roman emperor Theodosius I in the 4th century AD. The obelisk was erected during the 18th dynasty by Pharaoh Thutmose III, the Roman emperor Constantius II had it and another obelisk transported along the river Nile to Alexandria to commemorate his ventennalia or 20 years on the throne in 357. 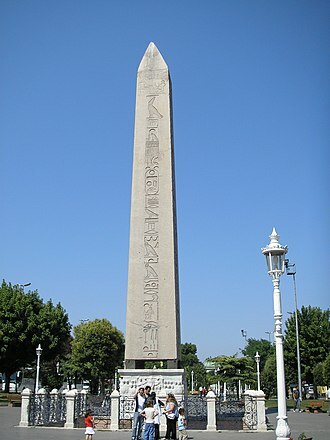 The Obelisk of Theodosius is of red granite from Aswan and was originally 30m tall, like the Lateran Obelisk. The lower part was damaged in antiquity, probably during its transport or re-erection, between the four corners of the obelisk and the pedestal are four bronze cubes, used in its transportation and re-erection. Each of its four faces has a central column of inscription. The marble pedestal had bas-reliefs dating to the time of the obelisks re-erection in Constantinople, in the bottom right of this scene is the water organ of Ctesibius and on the left another instrument. Eunapius was a Greek sophist and historian of the 4th century AD. His principal surviving work is the Lives of Philosophers and Sophists and he was born at Sardis, AD346. In his native city he studied under his relative, the sophist Chrysanthius, and while still a youth went to Athens and he possessed considerable knowledge of medicine. Eunapius was the author of two works, one entitled Lives of Philosophers and Sophists, and Universal History consisting of a continuation of the history of Dexippus. The former work is extant, of the latter only excerpts remain. It embraced the history of events from AD 270–404, the style of both works is marked by a spirit of bitter hostility to Christianity. Photius had before him a new edition of the history in which the passages most offensive to Christians were omitted, in his years he seems to have lived at Athens, teaching rhetoric. Initiated into the Eleusinian Mysteries, he was admitted into the college of the Eumolpidae, there is evidence that he was still living in the reign of the younger Theodosius. The Porta Asinaria, through which the East Roman army entered Rome. The obelisk of Theodosius I in Istanbul. Detail of the pedestal: Theodosius I offers laurels of victory; we can see the water organ of Ctesibius, in the lower right-hand corner. The Western Roman Emperor Honorius, Jean-Paul Laurens (1880). Honorius became Augustus on 23 January 393, at the age of eight. Roman provinces along the Ister (Danube), showing Dacia, Moesia and Thrace, with Sarmatia to the north and Germania to the northwest. The administrative divisions of the Roman Empire in 395, under Theodosius I. The Balkan Peninsula, as defined by the Soča–Vipava–Krka–Sava–Danube border. 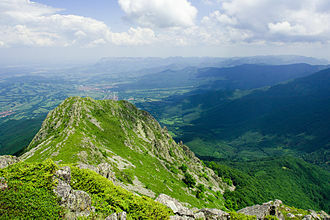 Panorama of Stara Planina. Its highest peak is Botev at a height of 2,376 m.
James G. Blaine finally gained the 1884 Republican nomination for U.S. president, in his third attempt – "Another victory like this and our money's gone!" The migrations of the Alans during the 4th–5th centuries AD, from their homeland in the North Caucasus. A nineteenth century depiction of Attila. Certosa di Pavia – Medallion at the base of the facade. The Latin inscription tells that this is Attila, the scourge of God. 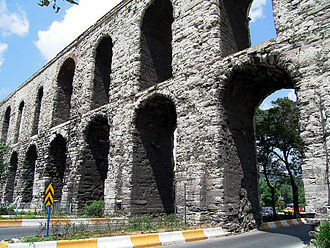 Aqueduct of Valens in Istanbul (old Constantinople), capital of the Eastern Roman Empire. 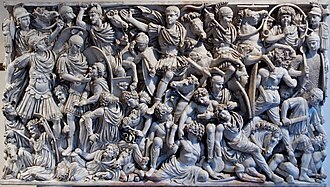 The 3rd-century Great Ludovisi sarcophagus depicts a battle between Goths and Romans. The Danube discharges into the Black Sea (the upper body of water in the image). Where the Danube Meets the Black Sea (NASA Goddard image). The historical source of the Danube in Donaueschingen. Ancient Roman road located in Syria which connected Antioch and Chalcis. This argenteus was struck in the Antioch mint, under Constantius Chlorus. Rare Domitian Tetradrachm struck in the Antioch Mint. Only 23 known examples. Note the realist portrait, typical of the Antioch Mint. Initial coinage of founder Ardashir I, as King of Persis Artaxerxes (Ardaxsir) V. Circa CE 205/6-223/4. Obv: Bearded facing head, wearing diadem and Parthian-style tiara, legend "The divine Ardaxir, king" in Pahlavi. Rev: Bearded head of Papak, wearing diadem and Parthian-style tiara, legend "son of the divinity Papak, king" in Pahlavi. Floor mosaics: Roman villa of Camino de Albalate, Calanda, Spain. The physical–geographical boundaries of Thrace: the Balkan Mountains, the Rhodope Mountains and the Bosporus. The Rhodope mountain range is highlighted. Skudrian (Thracian) soldier of the Achaemenid army, circa 480 BCE. Xerxes I tomb relief. A bust of Emperor Constantius II from Syria. The walls of Amida, built by Constantius II before the Siege of Amida of 359. Ammianus himself was present in the city until a day before its fall. A re-enactor portraying a Roman soldier of the 4th century AD. Soldiers similar to this would have been used by the Romans.